Our licensed, bonded & insured arborists are specialized in both large & hazardous tree removals. Call Sun Valley in Virginia Beach, VA for a free estimate. Do you have a tree or tree(s) in need of some pruning? 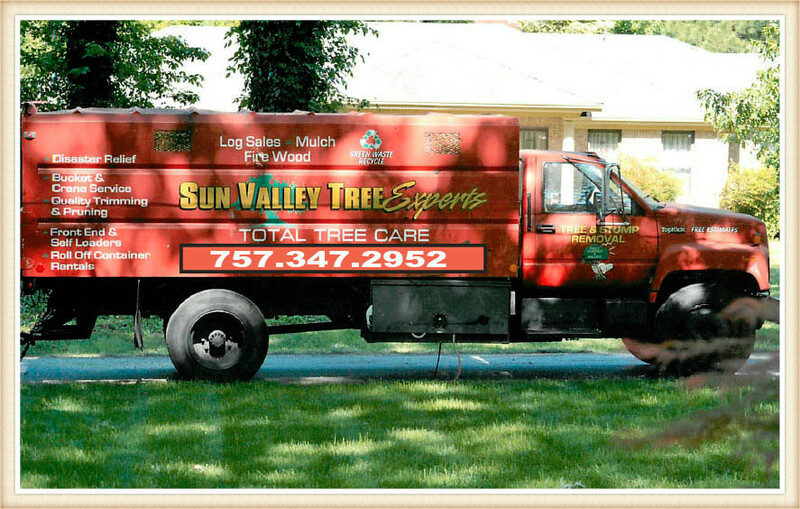 The staff at Sun Valley Tree Experts have been known for their tree trimming in Virginia Beach since 1981. Avoid risking your stump grinding or removal needs on a disreputable company. Call or e-mail Sun Valley Tree Experts today for your free & quick estimate. Our certified arborists have the expertise, skill and knowledge required to professionally tackle any kind of tree care project. They also understand the importance of completing those jobs quickly, efficiently and on budget. The many services we offer at Sun Valley Tree Experts are intended to keep your yard and property looking its best with healthy and strong trees and shrubbery. For your free estimate on any of our tree care services call or e-mail us at Sun Valley Tree Experts today. Trees that carry disease resulting from poor health or a pest invasion are a risk to other trees in your yard. Sometimes one can grown so big it may block the view you had of a beautiful landscape. These are two reasons that may see removal as the only solution. Our certified arborists can identify and diagnose tree health issues or help with cosmetic changes to your property quickly and within your budget. Pruning and trimming perform vital functions to the growth cycle of a tree. There is a certain time in the cycle where these actions can cause the least amount of trauma to a young or mature tree. The certified arborists at Sun Valley Tree Experts can examine a tree to determine what kind of trimming and pruning is required. They also are able to identify the correct time for that service in the tree growth cycle. It wasn’t long ago when if you had an old tree stump in your yard you had to either work around it or find some way to disguise it. Nowadays you can have that obstacle removed with a highly specialized machine. The stump grinder is unique in that it not only slices away at a tree stump layer by layer, but it also creates a useful byproduct. The wood chips created by the stump grinder can go back into your yard or garden. Severe storm activity can result in damage to trees and property. Broken branches and trees split by lightning are hazards to buildings, vehicles and people. At Sun Valley Tree Experts our certified arborists can advise you on what trees in your yard could become potential problems in a huge storm. We can not only clean up damage from a storm, we can show you how to prevent further problems from occurring. A number of factors can have a serious affect on the health of trees. They can cover the spectrum between pest infestation and poor soil conditions to too much moisture and shade. The certified arborists at Sun Valley Tree Experts are trained to identify whether or not they can treat sick or diseased trees. Sometimes more drastic measures are required in order to save the rest of your trees. Call or e-mail us today for your free estimate of any of the tree health care services we provide from our location in Virginia Beach, Virginia. We look forward to getting to know you and caring for your trees. There is a lot more to tree services than trimming, grinding and pruning. At Sun Valley Tree Experts we do all these things plus offer many other services to our customers in and around our home in Virginia Beach, Virginia. They include seasonal snow removal from driveways, parking lots, walkways and salting/de-icing where needed. To strengthen trees that are showing signs of weakness we can help with cabling and bracing service. In those hard to reach areas we can trim or remove hazardous trees with the use of our spider lift, and we also offer emergency tree services. This can be health or safety related projects that call for quick response and attention to trees and property. For those really large tree cutting jobs we provide crane service that assists in preventing damage to structures in the area of the tree being cut. We also provide lightning protection service which involves the installation of a support system to trees most likely to attract a strike. Why Sun Valley Tree Service in Virginia Beach, VA? Sun Valley Tree Experts has been in business since 1981 and has served customers in the Virginia Beach, Virginia area since 1996. We have customers throughout “America’s First Region” including in Chesapeake, Hampton, Newport News, Norfolk, Portsmouth, Suffolk and surrounding communities. We like to conduct an on-site inspection of the service required and that is how we determine our pricing. No two jobs are alike and as a result, our cost to customers varies from one job to another. Our goal is to provide you with affordable service quickly and professionally. That is why we request that you contact us direct for your free estimate of any of our many tree care service programs. Call or e-mail us at Sun Valley Tree Experts today. We offer discounts to senior citizens and military personnel as our way of saying thank you for all you have done for this great country of ours. Sun Valley proudly serves Virginia Beach & the surrounding area.